We had always said that in Australia we would hire a camper-van, partly to give us freedom of movement and also because we wanted to fit in as many different experiences as possible in the 7 months we are away. We ended up hiring a little two-man camper from Britz in Sydney for the remainder of our time in Australia and picked it up from the depot at the beginning of May. Our first excursion was a three day road trip to the Blue Mountains, just west of Sydney. The Blue Mountains is a rugged and rural area of dense forest, cliffs and waterfalls and is named after the blue haze that hangs over the trees when looking at a distance. 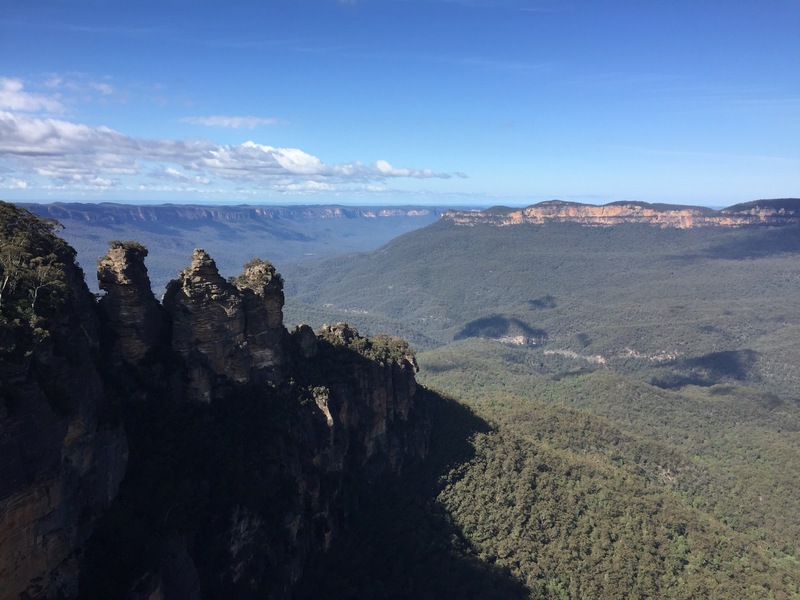 For many (us included), the main draw to this area is the Three Sisters rock formation at Echo Point (near Katoomba) which towers over the stunning Jamison Valley and while hugely touristy, is the place to get your photos. The commonly told legend is that the three sisters were actually three young women from a local aboriginal tribe, who were turned to stone by an elder in order to protect them from the advances of men from a neighbouring tribe. The elder is said to have died before he could turn the sisters back into human form and therefore they have stood at Echo Point ever since. Unfortunately some say that this legend was made up for tourism benefits around the 1920’s, so who knows whether it is actually true! 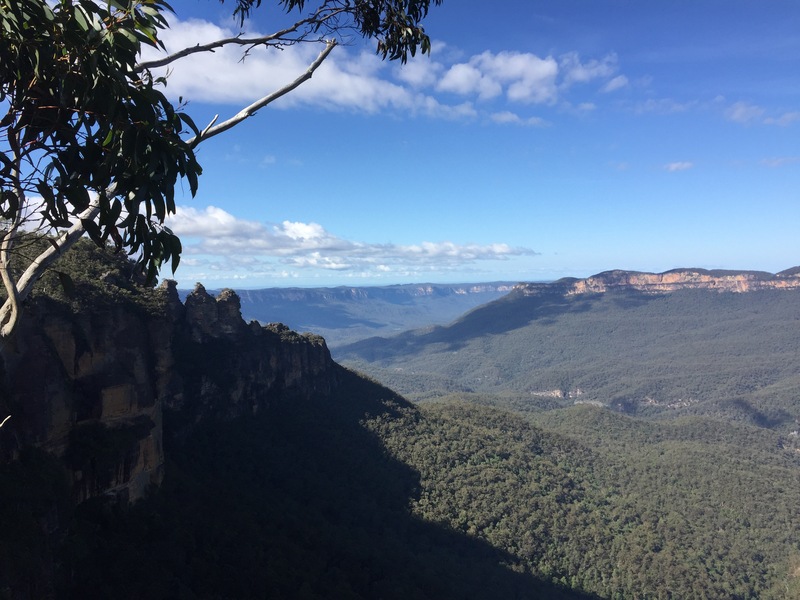 We stayed two nights in the blue mountains themselves and slowly made our way up to Katoomba, where we spent a whole day exploring. At night the temperature drops in the mountains considerably and we found ourselves sleeping fully dressed as it was so cold; I think one night it got down to 6 degrees! In Katoomba we parked in a free day rest area near the campsite we had been staying at and walked 45 minutes to Echo Point instead of paying the extortionate parking prices (7.80 per hour). This ended up being so worth it as the track to Echo Point itself has some spectacular views and because there are no bus tours that do this trail, you are relatively undisturbed. We braved the crowds at Echo Point for a while and then descended the Giant Staircase to one of the Three Sisters. We decided to head back at this point but if you want to carry on down, the stairway will take you into the valley down below. 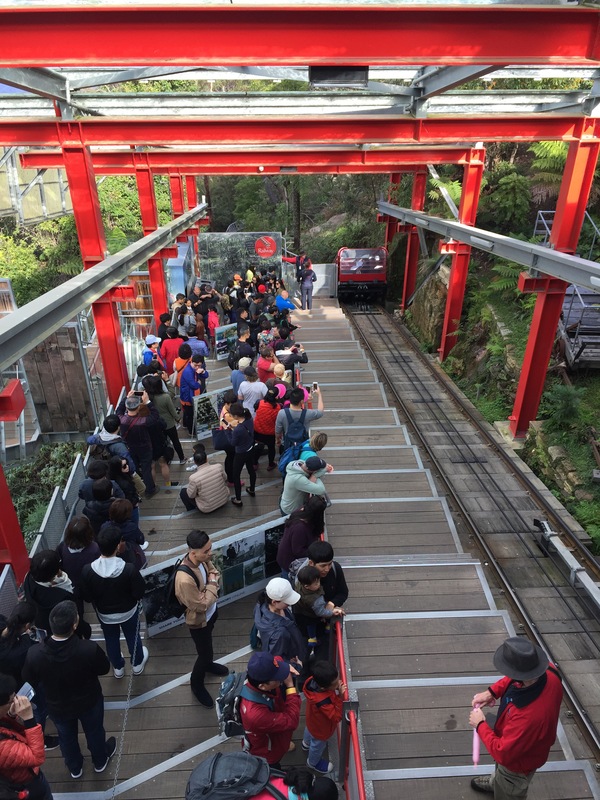 You can then get a Scenic World train or cable car back up for around $25 if you do not want to walk! We didn’t know this at the time but probably would have done this instead of paying full entry to Scenic World if we had known. 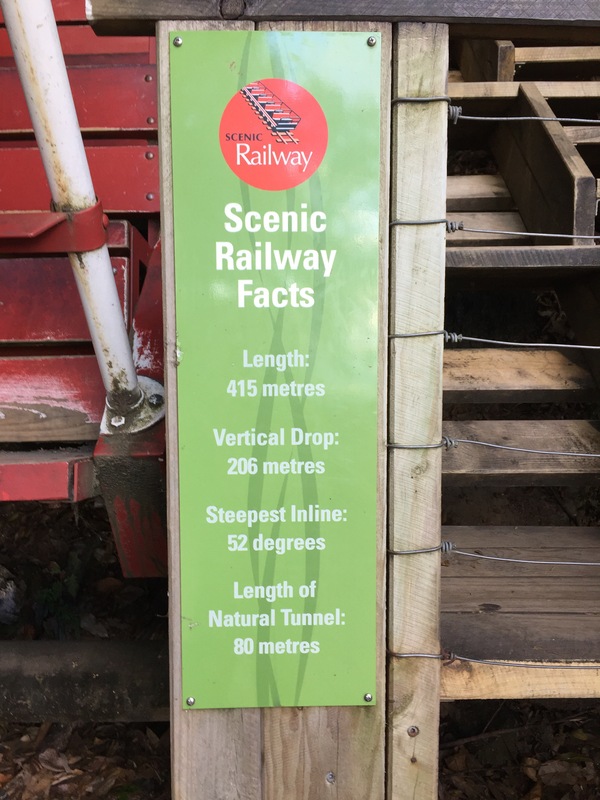 As well as the viewpoints, we wanted to head down into the valley itself and decided to head to Scenic World, a tourist attraction which offers three modes of transport up, down and over the valley; as well as valley walks and information about the area. You pay for the transport and can either buy single tickets (around $25) or an all-in-one ticket for around $50 that allows you unlimited rides on all three attractions. As I said, we wish we had walked down into the valley via the staircase and then only paid a one-way pass back to the top rather than paying the full price; however we did and therefore were determined to make the most out of it. We first got the ‘Scenic Skyway’ across the valley and back which does have some good views and a glass viewing floor, but is so short it really isn’t worth the money. We then decided to head down into the valley via the ‘Scenic Railway’ – the steepest passenger train in the world. 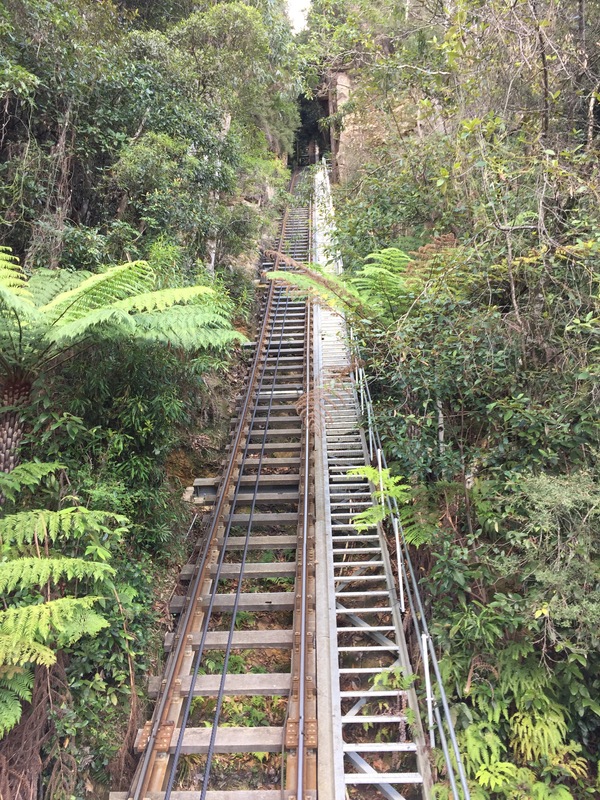 This railway is the main reason we even went to Scenic World, because as soon as something claims to be the best in the world it would be kind of rude not to go and take a look right?! The train rides 310 metres down into the valley at a 52 degree incline and is so steep you’ll find yourself desperately holding onto all of your belongings, while simultaneously trying not to slip off of your seat. Originally a coal mine cart track that used to take locals down to the valley for fun at the weekends, it was finally turned into a tourist attraction as it’s popularity grew. Once down in the valley, there are interlinking boardwalks that take you through the forest, with information about the history of the valley and the native plants and trees that can be seen. You can then either do the hour walk up the Giant Staircase (nope) or get the Railway or Cable Car back up to the top. We didn’t have that long as we were heading further into the blue mountains later that day so only did one the shorter valley walks (around 20 minutes) before heading back up to Scenic World via the Cable Car. 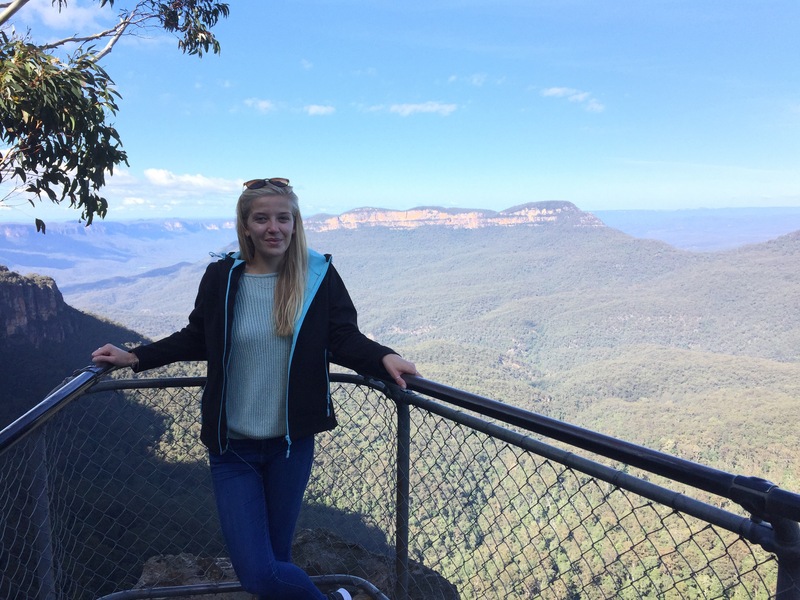 The Blue Mountains and the surrounding area is breathtakingly beautiful, just a stone’s throw away from Sydney. 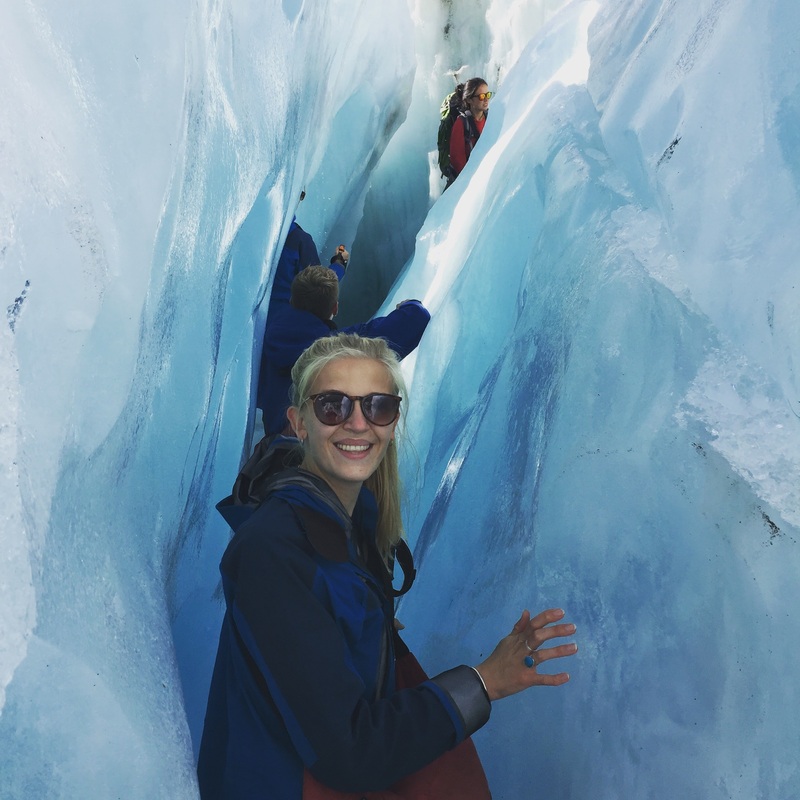 It makes for a perfect weekend getaway where you will be absolutely amazed as you immerse yourself in wildlife and wilderness, with picture perfect scenery that rivalled much of what we saw in New Zealand. (The Legend) You are preaching to the converted, we believe in Santa Clause, the Loch Ness monster and there are Fairies at the bottom of our garden! Location looks simply serene! There must be heaps of hiking trails there. The views were breathtaking! Yes there are so many bush walk trails up there- you could spend weeks doing them all!